Are you tired of recreating the same pages and layouts for your Squarespace site over and over? Have you tried duplicating the page or section to make a copy of your work? It’s a really quick easy fix to recreate or borrow elements that you’ve worked hard to place on your page. BUT… don’t just do it aimlessly or half way. Put some thought into what you’re doing and why. 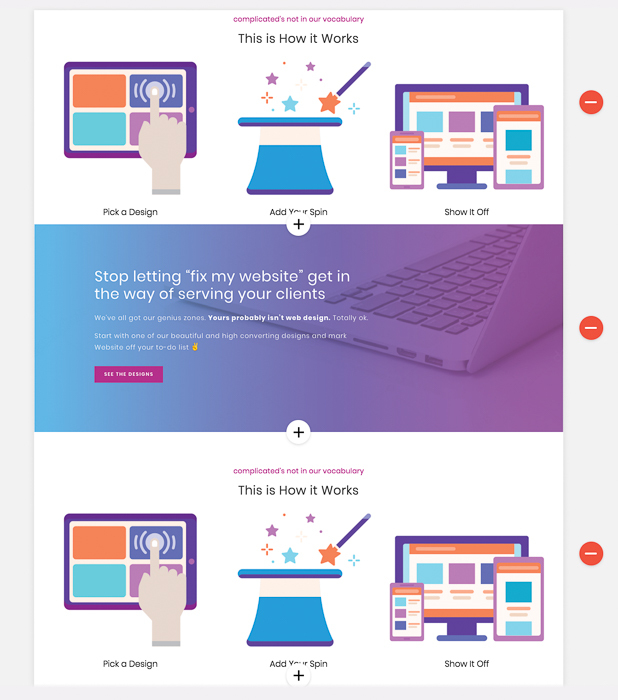 Your visitors will trust you more if things look cohesive on your website. This doesn’t just stop at fonts and colors and images (although those are heavily important) but even the layouts of your pages and sections matter as well. Think if you are walking up a flight of steps and that last step is half the size? Admit it you HATE when this happens and you almost trip every time! It’s because one small part isn’t consistent with the others. Being able to repeat elements from section to section with similar size and feel is important for your user experience. Not having to do the work 2, 3, 10 times. Those dang spacer blocks and trying to match up the lines with what can stack on top of each other, can be a little annoying. It’s great to have a block style drag and drop builder, but some times you just want something to go there and stick. After you do the work you sure as heck don’t want to do it all over again on a page that looks just the same over in another part of your website. Get one just right and not have to repeat. You can work really long and hard on one section that you know you want to duplicate and plan it out really nice. Once you’ve got everything adjusted, you can even insert in blank images, just get it the way you want it first. 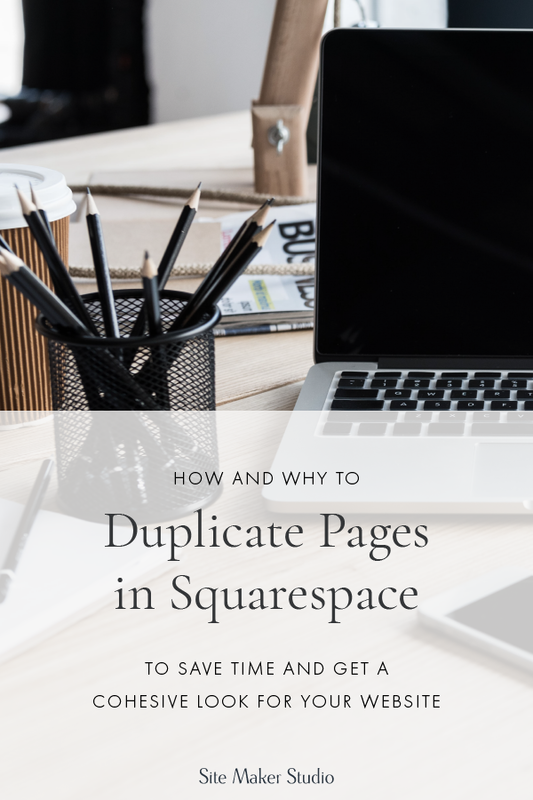 It will for sure ADD to your workload if you duplicate the pages first then have to go back into multiple pages to make small changes. Change anything that you can that’s going to repeat. Don’t forget things like image animations as well, even program those in, or the specific style of image block with or without a button. Do ALL of it before you duplicate. Calls to action can be consistent. Having one main call to action is something I work on with all of my website design clients. It’s nice to have a secondary one as well, that visitors can take, if they’re not ready for the main one (like to book a call) but how many ways can you say “schedule a chat” “book a session” “call today” “buy now” before you start to try and get fancy and you begin to break up that wording. Next thing you know you’ve got “buy now” and “shop here” and although it’s not going to break your sale possibly, it does make a big difference if you are using the same calls to action across your whole site. 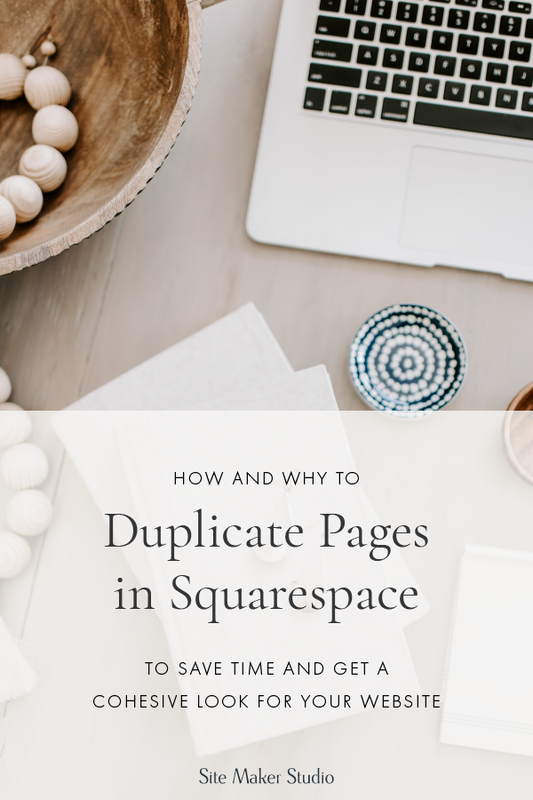 Duplicating pages and sections in Squarespace can help with this. Not to mention if they all go to the same landing page or download opt-in. Then you’re not having to relink every button on every section. Long scrolling sections with similar info broken up. I love the look of a big long scrolling page. Especially sales pages, when done right. I know I’m a nerd, who likes to look at sales pages, probably not you? But if you’re able to repeat elements of the page with similar backgrounds, pricing tables etc, it’ll help the page get built so much quicker. Watch the page slugs. When you duplicate a page, gallery, or item inside of Squarespace it cannot have the same url address. (site.com/yourlink) so it will instead make a new one (site.com/yourlink-1) or something similar. This will show up in the browser bar and your website visitors will be able to see it. CSS issues. Going along with what we just talked about, if you’re careful to rename your page slugs (your URLS) when you do duplicate a page, you’ll be able to take advantage of some css features that can make things like giving them all the same padding, the same background color, or the same width really easy if you know how to code. Banner images transfer too, which is usually a good thing. Again, visitors like consistency. We look for it as humans, we find patterns etc. It can be helpful that when you duplicate a page it will also bring with it the background image you’ve set. This saves you the time of going back through your desktop or file storage to find the same image. If you take it out of an index section it might look different. Be aware that if you had an image set as the background and that page was inside of an index section, when you duplicate it and take it out of an index section, the background image will no longer display behind it. You’d need to have it as part of an index page again to see the image behind the text. Watch for “copy of ______” titles or “name-1” titles. When you duplicate a page it’s pretty quick and easy to see that it’s added “Copy of” Home Index to the front of your page title. It’s less obvious when it does it to images, blog urls and gallery items. These often have a settings icon that you have to click to then go a level or two deeper to get to see a page slug or title of an image. Scroll to the bottom of the page settings and find the grey button that says DUPLICATE PAGE, click. 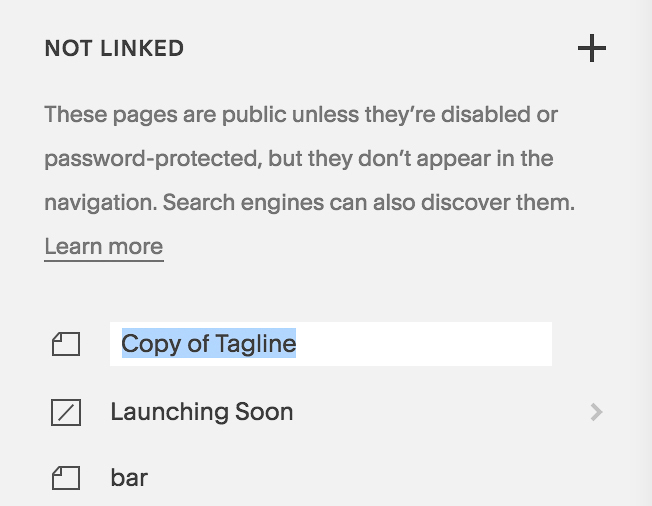 if you go into the individual page settings you can rename the Navigation Title (which will show in your navigation if you have it in primary or secondary navigation) and you can also change the Page Title which will show in the browser as a user visits that page. 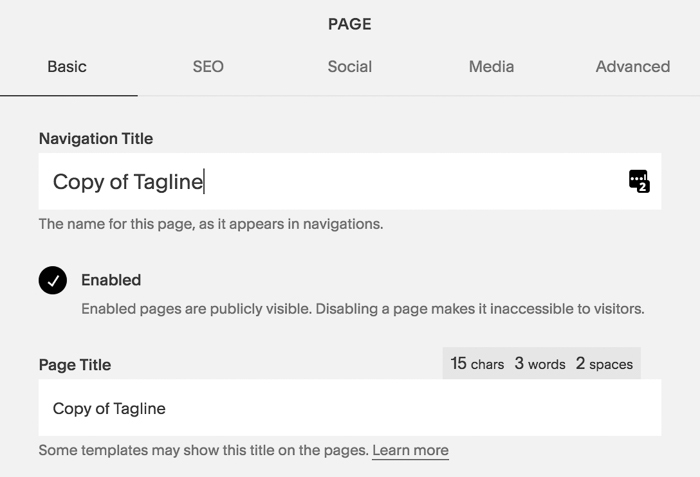 These can be different, and often the page title should have keywords and more info in it. The Navigation title should be simple and easy to understand (So BLOG instead of Musings of Me) etc. 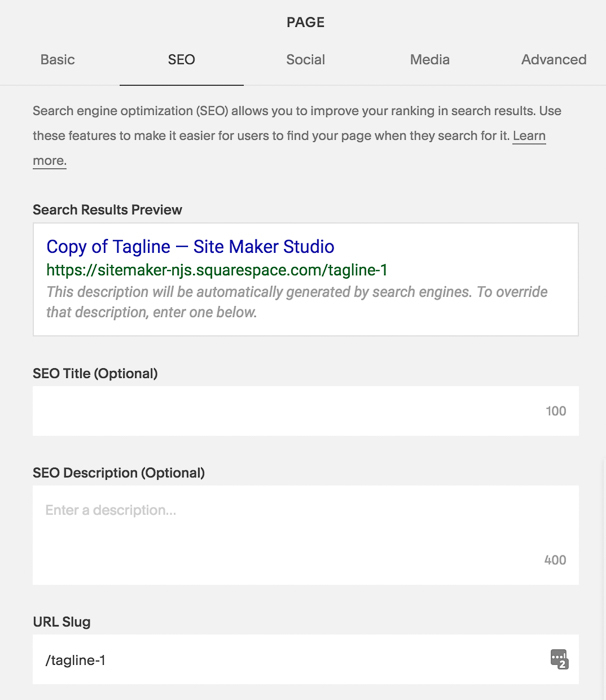 Once in the page settings you can also tab over to the SEO section. Here you’ll see your search results preview. This is where you’ll want to change your URL slug to something more easy to navigate. 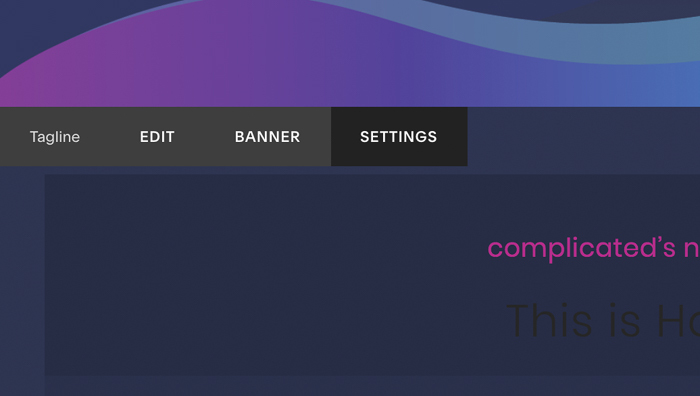 Keep in mind the customizations we talked about earlier and if this needs to be called Home Header or About Header, for consistency in customizing later on. Now you can easily drag around your new sections within the index pages and customize and make small tweaks, but as you can see the main ‘guts’ of the page stayed the same and consistent. Without you having to do the work all over again! Yay! Make your page slugs have similar names in other areas for possible future css or customizations. So for example if you think you might want to do something to all the “call to action sections” then make sure you name them all with CTA in the title. This way if you use CSS to say give them all the same background color you will be targeting pages specifically with the words CTA in the title. It will keep your customizations cleaner and you’ll be able to edit them all at one time should you need to make changes later on. 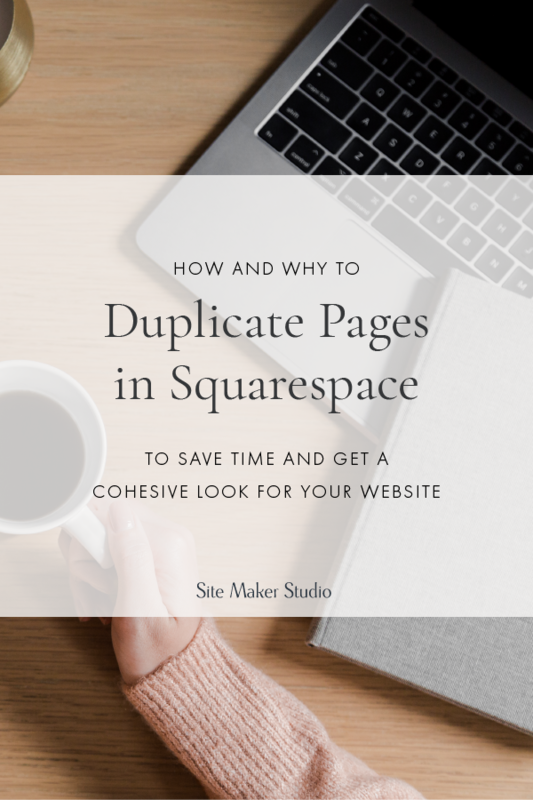 Squarespace’s entire article on duplicating pages can be found here. I’m not too good to admit Squarespace has it’s areas for improving this feature as well. Although all of these duplication areas are useful for 95% of users there are a few key things that would help not only designers, but also regular business owners like you, building their own sites. An entire site, If so I would have little need for the whole template shop. Block by block duplicates (copy and paste type feature) that would allow you to do all the settings for a block, and click copy and go to another page or part of a page and hit paste. Overall, although there are a few more things I wish this feature inside of Squarespace could do, it’s a very valuable tool in all the areas it’s available in. Just make sure you get the design right first, then duplicate, being careful of the things we talked about and you’ll have gained back a small amount of your time! How Do You Know Who Your Target Audience and Ideal Clients Are? Websites that are functional and beautiful just like the spaces you create. Ready to remodel your digital home? We work closely with professionals in the home and design industry to provide unique and well crafted messaging, branding, and custom website design solutions.